Leave your worries at the doorstep and join Christine Lavin and Don White as they reunite for this special night of comedy unlike any other, The Funny Side of the Street: A Night of Brighter Laughter. After more than 8 years of touring North America, Christine and Don began working on their own solo projects. This Bull Run Show is one of only two times that they are scheduled to perform together in 2019. AND Don will be celebrating his 62nd birthday this night so you know it will be a very special show. Christine and Don ARE two of the funniest entertainers on today's music scene. This is definitely a double trouble show. You'll laugh, you'll cry and you'll laugh some more. Two of America's most-loved songwriters and raconteurs join forces for this one-of-a-kind event. Christine Lavin is the mischievous singer-songwriter who brought us "Good Thing He Can't Read My Mind" (she later rewrote it from the male point of view) and "Sensitive New Age Guys" The Washington Post says "Lavin knows how to keep her audience guessing, thinking and laughing all at the same time." With a comedienne's arsenal of irony and wit, Christine's delightfully skewed songs cover a lot of territory. Relationships: "What Was I Thinking? ", politics: "Baracolate Chip Cookies", life's injustices: "Attractive Stupid People" and a lot more! Don White is a Lynn, Massachusetts-based songwriter who has the gift of connecting immediately with an audience. Coming from the world of stand-up, he is a funny man whose concerts can turn what happens in his home into an onstage biopic! His funny and often touching songs like "How to Get Your Kids to Leave Home", "Be 16 With Me", and "Rascal" go straight to his audience's heart. 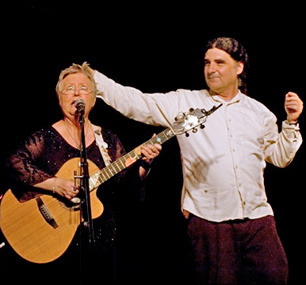 Together, Christine Lavin and Don White are the funny, funny 2-fer of comedy and song. Be prepared of anything.